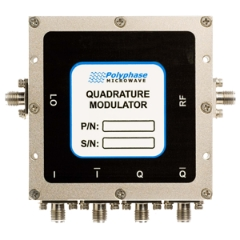 The QM0511A from Polyphase Microwave is a Modulator with RF Frequency 550 MHz to 1.1 GHz, RF Frequency 550 MHz to 1.1 GHz, LO Frequency 550 MHz to 1.1 GHz, Conversion Loss 8.5 to 10.5 dB, P1dB 7 dBm (Input). Tags: Module with Connectors. More details for QM0511A can be seen below.